Might I recommend 12 gauge, for all your intruder needs. i always sleep with a length of lead pipe under my pillow. 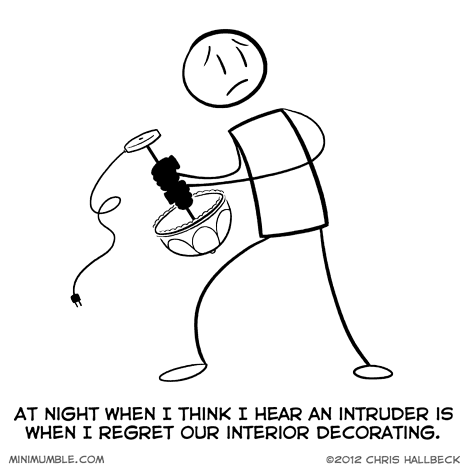 Other than the occasional unfounded paranoia, I’m usually pretty confident that there is no intruder when I hear a noise. The sound was my cats. If it had been an intruder, then at least one of the cats would be meowing at him for food. I have my Beavis Bat, inspired by the Beavis and Butthead episode where they tried to enter a American Gladiator-style competition. Their pugil-stick was a boxing glove on the end of a bat. Ended up being used in the Sega Genesis game. For those that prefer not to have a firearm in their home, put a can of wasp/hornet spray by your bed. It shoots accurate up to 10 to 25 feet (depending on the brand) and does wonders to the person’s face even if you hit them in the chest because of the toxic fumes. Personally, I like the .45 I keep next to my bed, though. It’s a polka record, isn’t it?